A good friend of mine gave me this Gucci scarf years ago. It is a 16 inch square, so it is small. And honestly, once around the neck you can't tell what the design is. My mom used to tell that it was so beautiful that I should frame it. And now that I have been seeing so many framed scarves around I think I just might. If I find a couple more scarves with the same color palette I would love to do a little gallery like the one below. I can't get this image out of my head. I love it. What about you? 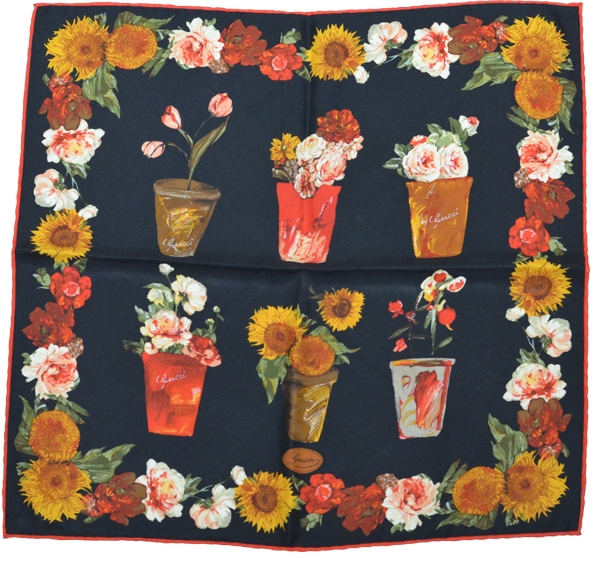 Do you have any lovely vintage scarves you would like to display to appreciate more? This is a beautiful idea! I think one can get their prints/scarves mounted with museum glass to cut down on glare and possibly fading as well! Loving your blog! Count me as your newest follower! I love that wall-so beautiful! I have only a couple of nice scarves, but once I am done wearing them, I'd definitely try this. Lola- I love the idea of a glass frame. I will keep it in mind. I have done that in the past with letters so you can see the front and back. ELizabeth- Thanks for stopping by. So glad you did. If you would ever be interested in doing a guest post on The Corner Apartment, I would love to have you! Let me know!